Soon there’ll be a new addition to the family – a sister for my grand-daughter. So, that means baby shower time. I did a bit of baking for this. 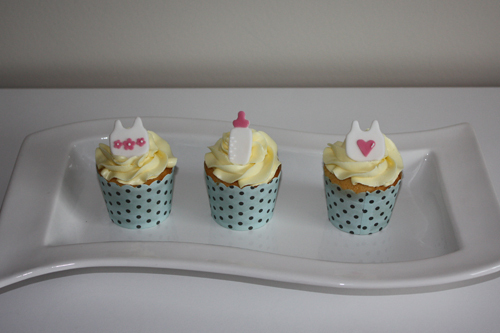 First up lemon cupcakes with a lemon swiss meringue buttercream icing and decorated with fondant baby bottle and bibs. 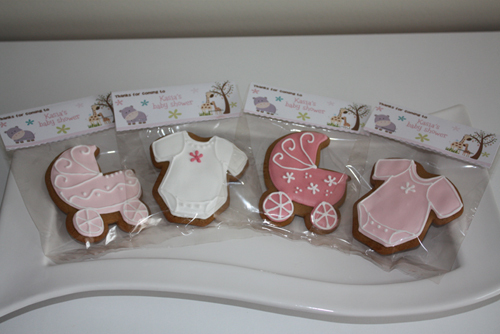 Then for each guest to take home baby shower cookie favours. Gingerbread cookies with royal icing decorations. Was a great baby shower, Kathleen did a fantastic job organising it all and cooking up a storm. This bubs is going to be spoilt with so many grandparents! I did my first ever workshop last month – teaching icing basics and making a Christmas cake topper. The workshop was organised through a local church women’s group. About 35 people attended – a great turn out. I was very nervous in front of so many but they were all really lovely. Got some great feedback on the day, and everyone did really well – there were some great creations made, a lot of talent out there. Besides the nerves (is hard demonstrating detail work when your hands are shaking) I really enjoyed it. If the demand is there I think I’ll do more of these. So would love to hear from you if you have a group that would like to do a workshop with me.